Mary Pinkston, a University of Delaware alumna, is Delaware Teacher of the Year. 11:28 a.m., Oct. 30, 2009----Mary Pinkston, a University of Delaware alumna, has earned the top honor of Delaware's Teacher of the Year for 2010. She beat out 19 other district finalists throughout the state for the honor. Gov. Jack Markell announced Pinkston as the "top teacher" on Tuesday, Oct. 27, at a dinner at the Dover Downs Hotel and Conference Center in Dover. She has 17 years of teaching experience, all in the Brandywine School District. Pinkston is not the only UD graduate who competed this year for the title of Delaware Teacher of the Year. Of all 20 of the district finalists, seven of the educators earned their master's degrees or took graduate coursework at UD and three teachers earned their elementary teacher certification from the University's School of Education. The Teacher of the Year Selection Committee received numerous endorsement letters for Pinkston from both her colleagues and students. “Ms. Pinkston has a passion and desire for her students," wrote Brandywine High School Assistant Principal Cordie Greenlea. "She works to ensure that her students are proficient and successful in the courses she teachers. She sets high expectations and establishes clear goals for her students to reach." "You were the teacher that all of my fellow classmates seemed to respect the most. I think I can speak for all of them when I say it is because you had faith in us," wrote Kaitlyn Steffan, one of Pinkston's former students. "You helped me re-discover why I want to be a teacher in the first place. If I could make a group of students, or even just one student a day, feel the way you made me feel, then I will be eternally satisfied." Pinkston is currently a mathematics teacher at Brandywine High School in Wilmington. She graduated from UD in 1992, with a bachelor's degree in secondary mathematics education. In 1995, she returned to the University for a master's in education curriculum and instruction, specializing in secondary mathematics. She is also involved in many professional associations and has been the recipient of several awards and honors since becoming a teacher. 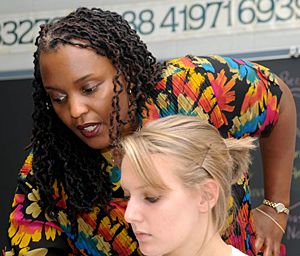 When asked about her philosophy of teaching, Pinkston wrote, "There are no greater awards for me in this profession than when I see students' eyes light up when they finally understand a concept, grow to become independent learners, begin to appreciate mathematics, and express gratitude about how much they've learned." As the state winner, Pinkston will receive a $5,000 grant to use for the educational benefit of her students, as well two personal grants totaling an additional $5,000. The remaining 19 school district candidates will each receive a personal grant of $2,000. Pinkston will now go on to compete for the national Teacher of the Year award in April.